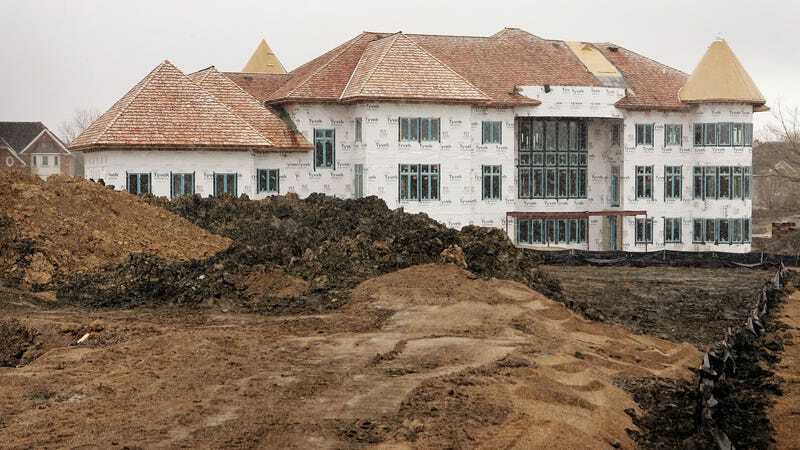 Is Zillow's Claim Against the Blog McMansion Hell Legit, or an Embarrassment? A specimen of the form, 2006. Image via Getty. Late Monday afternoon, the blog’s creator Kate Wagner posted on Twitter about an alarming letter she’d received from the company, and asked for help as to what to do with it. “It has come to our attention that you... are copying, modifying, and publicly displaying content from the website https://www.zillow.com... owned and operated by Zillow, Inc... on Your blog ‘McMansion Hell,’” the letter opens. “In addition to violating the Terms, Your actions infringe the rights of each copyright holder of the Images,” the letter adds. Wagner has taken the website down temporarily, but said on Twitter it should be back soon. Wagner is a Johns Hopkins grad student studying architectural acoustics, specifically those of concert halls, but the Tumblr was born last year out of a lifelong interest in houses going back to a childhood fascination with HGTV. “There’s so much American housing that hasn’t been studied in any sort of academic way, and of course the blog is not the way to examine that, but it’s part of a greater research project of mine, which is to document the changes in American housing in the last 40 years, architecturally and economically and sociologically,” she told The Hairpin last year. The blog’s popularity presented her with an unexpected opportunity, providing Wagner with income via merchandise, Patreon fundraising, and freelance pieces. “This blog is my entire livelihood and I am at risk of losing everything,” she told The Verge of the Zillow letter. It’s worth digging into Zillow’s claims in the letter, however, to see if there’s any substance to them. The first wrinkle is that Zillow isn’t the copyright holder of these photos. While the Zillow terms of service grants the site a pretty broad license when you upload your photos as part of adding a listing, it’s not an exclusive license, notes Jeff Hermes of the Media Law Resource Center. So they wouldn’t have standing to file a copyright suit, because they don’t have exclusive rights to the images. Those remain with whoever took the photos—which are of course taken for the purposes of marketing and publicity and tend to be fairly broadly used across the internet, often without issue. The bigger principle at stake is that of fair use. “The important thing to understand is that copyright law strikes a balance between the rights of creators and the rights of others to use the work which creators produce,” explained Hermes. “In that context, fair use is one of the most important protections that the public has against copyright law creating an excessive restriction on their exercise of their First Amendment rights. Fair use is a doctrine that, among other things, protects the use of copyrighted works for cultural purposes, for the purposes of news reporting and commentary, for the development of new and interesting ideas, while at the same time continuing to protect the right of creators to recognize a return on their work.” While fair use very much depends on the specifics of each case, Hemnes said he thought that “there’s a strong argument” in this particular instance. “There’s an obvious case for fair use is the way I would put it,” said Joshua Schiller of the firm Boies, Schiller and Flexner, who has litigated fair use cases representing the artist Richard Prince. The way he sees it, the blog is both satire—“it’s reflecting on what our culture likes”—and also a form of cleverly presented architectural criticism. “What right do they have to censor someone for mocking how in suburban American architecture is cheap and poor and distasteful?” he added. “This is where fair use is really important, is to protect people like this blogger, who is otherwise being threatened with censorship,” Schiller said—unless she can manage to get good legal help. Then there’s Zillow’s mention of the Computer Fraud and Abuse Act, which is a hacking statute. It’s generally for offenses like your classic shadowy person forcing their way into somebody’s email and leaking the contents, but can also apply to, say, using your old login to slip somewhere and snag a previous employer’s proprietary information. We reached out to Zillow for an explanation of why they cited the act but they didn’t comment. Of course, legal arguments are all well and good, but you can have the best case in the world and not have the money to defend yourself. Zillow had also argued the submission of the photos by the real estate agents gave it an implied license to post them on the Digs site and advanced a fair use defense, arguing it was allowed to copy the photos from the main to the Digs site. Zillow has a legal obligation to honor the agreements we make with our listing providers about how photos can be used. We are asking this blogger to take down the photos that are protected by copyright rules, but we did not demand she shut down her blog and hope she can find a way to continue her work. Meanwhile Fortune notes that the case that birthed the term “Streisand Effect,” shorthand for attempting to quiet something via lawyering that results in infinitely more bad publicity thanks to the way the internet works, was originally about photographs of a mansion.